Etienne Adrien Drian was a multi-talented artist who worked in Paris in the first half of the 20th century. He was a painter, decorator, set designer, printmaker, and illustrator. 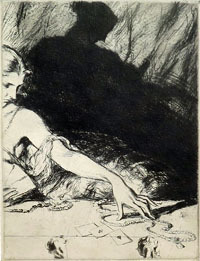 This etching is one of ten he did to illustrate a collection of short stories by Henri de Regnier (1864-1936), who was considered one of the most important French Symbolist writers of early 20th century. Drian was known for his depictions of women, especially elegant Parisiennes. He often painted and designed extravagant costumes for his close friend, the great comic actress Cécile Sorel. He designed both the sets and costumes for her show at the Casino de Paris in 1933. Bénézit, Dictionnaire Critique et Documentaire des Peintres, Sculpteurs, Dessinateurs et Graveurs, Gründ, Paris, 1999.